Teach to One: What happens when computers pick what students learn? Students, meet your new lesson planners. About 150 sixth-graders are in this math class—yes, 150—but Garuccio’s task was to help just 20 of them, with a lesson tailored to their needs. He asked, “Where does the decimal point go in the product?” After several minutes of false starts, a boy offered the correct answer. Garuccio praised him, but did not stop there. A computer system picked this lesson for this group of students based on a quiz they’d taken a day earlier. Similar targeted lessons were being used by other teachers and students working together, in small groups, in an open classroom the size of a cafeteria. The computer system orchestrates how each math class unfolds every day, not just here, but for about 6,000 students in 15 schools located in four states and the District of Columbia. As more schools adopt blended learning—methods that combine classroom teachers and computer-assisted lessons—some are taking the idea a step further and creating personalized programs of instruction. 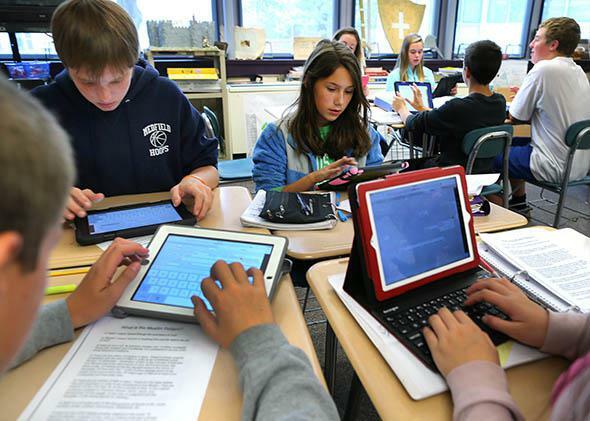 Technology can help teachers design a custom lesson plan for each student, supporters say, ensuring children aren’t bored or confused by materials that aren’t a good fit for their skill level or learning style. At David A. Boody (I.S. 228)—a public school in a Brooklyn neighborhood where five of every six students qualify for free or reduced-price lunch—teachers use a program called Teach to One: Math. It combines small group lessons, one-on-one learning with a teacher, learning directly from software, and online tutoring. A nonprofit in New York City, New Classrooms Innovation Partners, provides the software and supports the schools that use it. New Classrooms evolved from a program created several years earlier at the New York City Department of Education. One key feature of the program is apparent even before instruction begins. The entrance to the math class at David A. Boody looks a bit like a scene at an airport terminal. Three giant screens display daily schedule updates for all students and teachers. The area is huge, yawning across a wide-open space created by demolishing the walls between classrooms. The open design is meant to encourage collaboration; teachers can learn from each other by working in close proximity. Shelves, desks, and whiteboards divide the large room to create nooks for small-group instruction. Each area has a name, such as Brooklyn Bridge or Manhattan Bridge, which helps students know where they are supposed to go. Sometimes students are instructed by teachers; other times they work in sections monitored by teaching assistants. Some stations use pencil-on-paper worksheets with prompts to help guide students through group projects; stations in another part of the classroom are for independent computer-guided lessons and tutoring. Dmitry Vlasov, an assistant math teacher, scanned his section of the room where more than a dozen children worked on small laptops independently. If needed, he would help a student who was stuck, but he said most students don’t require much more than a nudge. “They treat it as if it were a game,” Vlasov said. All this activity in the large, high-ceilinged room creates a constant buzz, which seemed to distract some students. Teachers had to remind them not to peer around the big room. Students seated in the back appeared to have trouble hearing the teacher. Math class spans two 35-minute sessions, with students and teachers rotating to new stations after the first session. The school has about 300 students in the math program. Half of them report to class at one time. On a recent day in December, the classroom was staffed with one math director, five teachers, two teaching assistants, and a technology aide. The program’s computer system coordinates where everyone will go based on how the children perform on a daily test at the end of class. The next day’s schedule is delivered electronically. Teachers, students, and parents can log on to a website to see it. The software used by the Teach to One system pulls lessons from a database created and curated by the program’s academic team. When Teach to One staffers discover a lesson that fits their program, they negotiate with the publisher to buy the lesson à la carte—sort of like buying one song from iTunes instead of buying the entire album. Staffers say they examined about 80,000 lessons to create a library of 12,000 from 20 vendors. A room in the office of the nonprofit is filled with stacks of math textbooks. According to Joe Ventura, a spokesman Teach to One’s parent company, New Classrooms, schools pay $225 per student each year in licensing fees to use the content in Teach to One’s curriculum—the materials that replace the typical textbook. They also pay between $50,000 and $125,000 a year for professional development and support services, but those fees typically decrease as schools gain more experience running the program, Ventura said. Schools in New York City don’t pay the software licensing fees (although they pay some of the other costs), because the program originated within the city’s Department of Education; the nonprofit that now runs Teach to One was created by former Department of Education employees. Ventura said they are in negotiations for a new contract but could not elaborate on details. Requests for information from the Department of Education brought no reply. Supporters say the program gives every student a custom-designed math class, allowing students to get different lessons, and move faster or slower than peers in the same class. Skeptics of this type of program say more evidence is needed to justify the time and expense. Teach to One’s founders, hoping to demonstrate that the program works, commissioned a study by an education professor. The first year’s results were mixed. A second-year study, released late last year, documented significant progress in 11 of 15 schools in the program. Although students still scored lower on math tests than national averages—many are from disadvantaged populations—the growth in the Teach to One students’ scores outpaced national averages. Changes made after the first year’s report, and increased teacher and student familiarity with the program, might explain the improved results, Ventura said. The updates included improvements to an online portal where students and parents can track progress and continue to work on lessons outside school; the addition of 130 multiday collaborative student projects; refinements to the algorithm that is used to select lessons, and expansion of the library of lessons. The early research on Teach to One: Math shows schools that use the program have improved test scores, but could not conclude that Teach to One is the reason. The author of the research on Teach to One: Math, Douglas Ready, an associate professor of education and public policy at Teachers College of Columbia University, was cautiously optimistic. (The Hechinger Report, in which this article first appeared, is an independently funded unit of Teachers College.) He noted, though, that the early research could not determine whether the improved math scores could be attributed to Teach to One or had been affected by some other factor in the schools. The next step in evaluating the program will be supported by a $3 million U.S. Department of Education grant, announced this month. That grant will pay for deeper research into Teach to One, as well as an expansion of the program to more schools in one of its other cities, Elizabeth, New Jersey. Gary Miron, a professor of evaluation, measurement, and research at Western Michigan University, is generally positive about the possibilities of blended learning. Asked by the Hechinger Report to review the research on Teach to One, he said the gains were “quite remarkable.” He noted, however, that there is a lot of pressure on schools to show gains on tests, which can lead to inflated scores. That said, Miron is enthusiastic about the possibilities for blended learning programs that invest in both quality teaching and technology. Most online programs—in which students don’t ever report to a brick-and-mortar school—have less promising results, he said. “That is the future, blended learning,” he said.